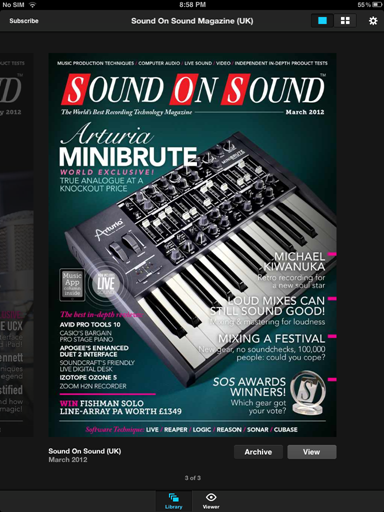 I’m a great believer in multimedia as an educational delivery format, so it’s some pleasure to say that Sound On Sound magazine is finally available for iPad, via the Newsstand application. Earlier this year an iPad joined the ranks of the computer-based devices slowly taking over our home. While I don’t think it’s the quintessential lifestyle device that Apple marketing make it out to be, it is a pretty amazing piece of technology, and quite a lot of fun. When I first started working in multimedia we dreamt of a device like this for delivering educational multimedia. The CDX General Service course taught people how to fix cars through instructional theory and tutorial videos, interactive knowledge checks, and workshop task sheets and assessment materials in PDF format. Allowing the student to take this material into the workshop in a portable, easy to use format was something that we knew would eventually be possible, but to have it become a reality no more than a decade later makes it a pretty exciting time to be alive, and bodes well for the future of technology in education. The SOS team have done a great job of embracing the technology available in this format to enhance the magazine. Rather than just porting the printed version to on-screen text, they’ve added embedded videos and audio files, high resolution “pinch to zoom” images, and interactive information boxes. If you’ve got access to an iPad you can check out the January 2012 edition for free, subscribe to the iPad version, or purchase the February and March editions individually, via the App Store. 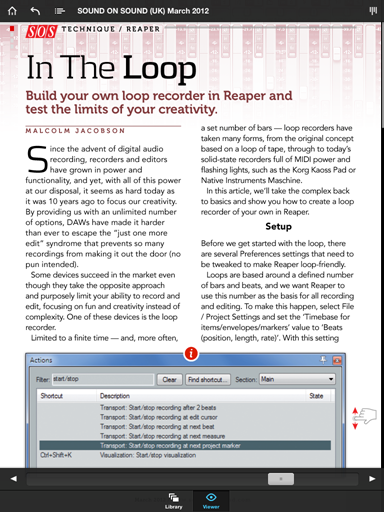 This entry was posted in Reaper, Sound On Sound. Bookmark the permalink.